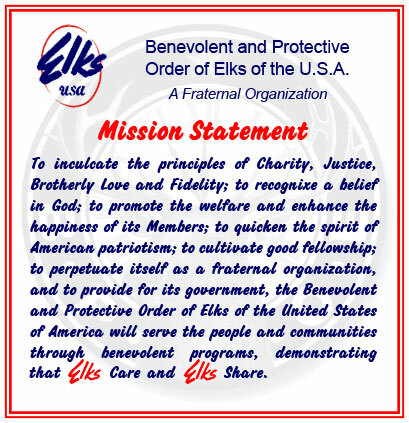 Benevolent and Protective Order of Elks of the U.S.A.
Michael T. Luhr was born in Petersburg, Alaska, on August 22 to Donald H. Luhr and Beulah E. (Reid) Luhr. Michael has one brother, Robert, and two sisters, Donna and Joyce. He attended elementary and high school in Petersburg, graduating in 1974. Michael started his working career at the age of 9. He served as a janitor at a Ben Franklin store for two years, shelved boxes at a grocery store for two years, and worked at a fish cannery for another year. Through a school work program at the age of 15, Michael worked at a machine shop during the summers until graduation. Upon graduating from high school, Mike worked with a logging company, a mining company, and a road construction company. In 1980, he purchased the floating machine shop where he worked as a teenager, becoming the fourth owner of the business. In June of 1984, Michael met his wife Barbara (Barb) at the local daycare facility where their respective children were enrolled. Mike and Barb had their first child, Bradee, in 1989, and were married on January 8, 1991. Together they have four children, Sabrina, Francis IV (John), Justin, and Bradee, and five grandchildren. Also in 1984, Barb joined Michael to operate the machine shop. They worked together as sole proprietors until 2011, when a group of fishermen approached them with an offer they could not refuse. With the support of 25 local fishermen, Mike and Barb bought the shipyard in Petersburg which had closed the previous year. Today, the business employs 17 people and provides a full-service ship store with vessel haulout, engine service, and machine shop facilities. Michael was proposed and initiated into Petersburg Lodge No. 1615 in November 1977 by his father, Exalted Ruler Donald, along with ten of his lifelong school friends. He served as a Trustee from 1990 to 1998 and was appointed as Esquire in 1998. He continued through the Chairs and was named Exalted Ruler in 2001–2002 and 2002–2003. He was elected to the Trustees again, serving from 2003 to 2008. He has served as the Lodge Treasurer since 2008. Michael began his service at the State level in 2004 when he was elected as Trustee. He was elected and served as President of the Alaska State Elks Association in 2009-2010 and continues to serve as Chair of the ASEA’s Charitable Trust Fund, Advisory Committee Chair, and on the Lodge Development Board. At the Grand Lodge level, Michael was appointed District Deputy Grand Exalted Ruler of Alaska’s East District in 2005-2006, 20072008, and 2008-2009. He was appointed to the G/L-Lodge Activities/State Associations Committee from 2010-2012. He was appointed as Special Representative to the Alaska East District in 2011, serving through December 2017. In 2012, Michael was elected to represent Area 8 on the Board of Grand Trustees, serving as Building Applications–West Member in 20122013, as Secretary of the Board from 20132015, and Vice Chairman in 2015-2016. He was appointed as Special Deputy Grand Exalted Ruler for the State of Alaska from 2016 to the present. At the G/L Convention in Reno, Michael was elected and installed as Grand Esteemed Leading Knight and served in that capacity for the 2017-2018 fraternal year. On a personal level, Mike was very active in baseball growing up and is in the Little League Hall of Fame. He coached women’s softball and Little League for many years until the Elks became his passion. Children John and Bradee, as well as son-in-law Adam, are all Members of the Elks and were initiated by Michael.